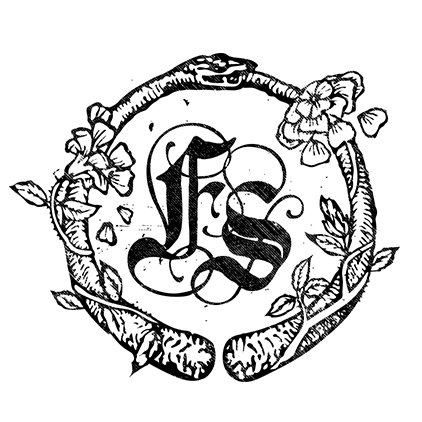 March 22, 2016 by Feral StrumpetLeave a Comment on Feral Spring– What’s New? Great news for my regular customers– you can now find all my lastest designs in the What’s New section of feralstrumpet.co.uk. 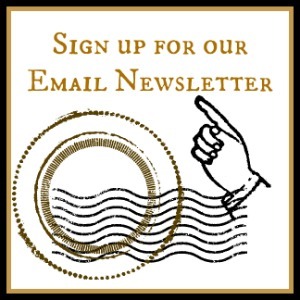 I’ll be adding new items weekly so there will always be something novel for you to check out! November 12, 2015 by Feral StrumpetLeave a Comment on Happy Friday the 13th! 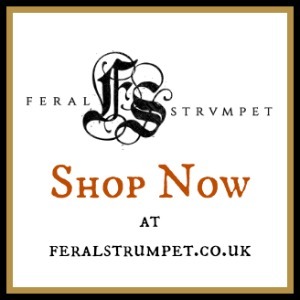 13% off from Thursday, November 12th-Friday, November 13th– at http://www.feralstrumpet.co.uk and Feral Strumpet on Etsy. Loads of new items have just been listed as well! Last week I was staying with a group of writers in a rambling old house in the woods and photographer Gordon Fraser was there with this Katamari-looking portable darkroom and trays filled with mysterious fluids. Every day these glass plates would transform to little windows of shadow, revealing the woods around us. I was so excited to sit for him– this involved a neck brace thingy, as one has to remain very still, and a camera that looked like a cross between a wonder cabinet and a concertina. Also there was a pink velvet cape involved. The less said about the sheep’s skull the better. When did you first start taking photos with antique cameras? What prompted you to start working in this way? Well, there is a long long story about how i came to end up taking photos, full stop. However, the vintage camera thing happened because i was specialising in making fine art photographs with my iPhone and one of the post processing styles i was interested in was a Man Ray style of solarisation, which i then started to tinker with and found “plate photography” overlays. I liked the vintage look and decided to find out more…and then I saw a video on youtube of a guy who did the actual Victorian process and I decided I’d have to have a go. It was around June 2012 I decided to try to get involved and it was Sept 2012 by time I got a camera and took a course. You need to take a course I think, there are serious health and safety issues involved here as some of the chemicals you need to mix up are very dangerous indeed. Where did this particular camera come from and does it have a history? The one I used for your image was a late 1800’s Tailboard Studio camera that shoots 10″x12″ plates…that’s what you call Ultra Large Format these days. I got it from India and it was in quite spectacularly good condition. My other camera is a smaller french one from Paris 1885 and it was a mess and needed a lot of work to get going. One of the more interesting aspects about your portrait was that I used a period accurate lens with a Petzval design. That is one of the reasons there is such a fall off in to out of focus and also why the out of focus areas look so beautiful. Those old lenses have a focal plane that is quite unlike any modern lens and it gives the picture a very specific look that I find quite beautiful. I’ve noticed from viewing your other portraits that you seem to capture the essence of a person, and not just their image. Do you see a difference in collodion portraiture versus other cameras? Yes indeed I do. The collodion process is slow and involved. The plates themselves have about 100th the light sensitivity of your digital camera. That means unless you are using very powerful studio strobe lights or are outside on a bright sunny day, you are looking at exposure times measured in seconds up to minutes. Outside in the shade in the summer your shot was, I think from memory, 15 seconds. That’s a long time for someone to put on a forced smile…there is nowhere to hide. This means that often a sort of tranquility or thoughtfulness appears in the sitters’ features. It’s as if you are truly seeing in to someones soul. My portraits using my previous digital cameras were not the same. The fragility and physicality of this process is fascinating– can you talk about your favourite part of this labor-intensive method? I think my favourite part is the bit at the very end. With the process you spend days preparing chemicals, cutting and polishing glass, making sure everything is clean and ready to go. Then there is the ritual, like a dance, for making the plate light sensitive, pouring on the collodion brew, dunking it in the silver bath and the short prayer to the collodion gods in the hope it will all work. Then the short 5 minute window of opportunity where you must compose and make that perfect image. Counting out in your head the seconds till you put the lens cap back on…then back in the dark room to develop, followed by the climax, my favourite bit, The Fix. The fix is the moment when your plate turns from one state in to another and you see the final image appear before your eyes. It’s amazing. I’ve done loads of plates now but every time I see that happen I smile. 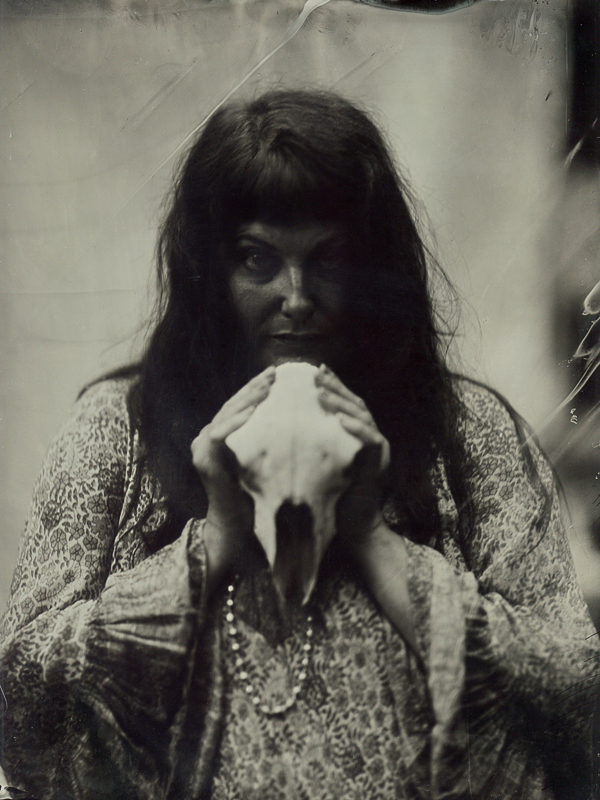 If anyone would like their portrait taken using the wet plate process what is the best way to contact you? Ode to Poe, The Third and Final Post. January 19, 2012 January 19, 2012 by Feral Strumpet4 Comments on Ode to Poe, The Third and Final Post. Happy Birthday, Edgar Allen Poe. Thank you to everyone who has stopped by the blog and has helped promote my shop over the last few days of this Poe-party. The winner of the Poe Grimoire bookmark has been chosen by the whims of fate (out of a hat), and she is the inimitable Jo Taylor– fantastic dancer and member of the wonderful 400 Roses Morris side. Beautiful Jo is in the back row, far left! Another manifestation of the Nevermoore bookmark is, of course, still available in my Etsy shop! I found myself in a little village in North Yorkshire, after living in London for six years. My fledgling career as a massage therapist suddenly stalled as all my clients were still in London and I knew no one and had no way to build up the business again through word-of-mouth. After working for myself as a therapist I knew I couldn’t work in an office again. Could I start another business and would it be viable? What lessons could I bring from my massage practice to a new venture? I had long been an Etsy shopper. 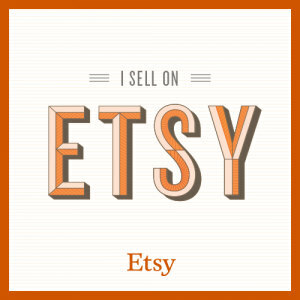 Whenever I needed anything I would check Etsy first, preferring to buy from an individual maker. Plus, artisans on Etsy usually had unique and wonderful solutions and options. I began to think, what if I sold things I made on Etsy? Friends had often commented that I should sell the jewelry made, but I thought no one would pay me for such things. I was wrong! It is four months into this journey and already Etsy has helped me make my first mortgage payment. I have found not only a wonderful customer base of friends, internet acquaintances and most amazingly, strangers who have found my shop. But I have also been surrounded by supportive fellow-makers and shop owners. When you wake up in the morning and set up your tasks for they day, they form a kind of virtual team, giving you high fives and thumbs up with messages and “likes” as well as team discussions. They also pose a constant source of inspiration when you see what they’ve been up to. Working alone in my little studio can get lonely and isolating, so having these creative fellows about has made a huge difference. Four months is a bit of an arbitrary anniversary, except that listings on Etsy go in four month cycles. Everything I listed from that first cycle, save one necklace, has sold. I’ve celebrated by reassessing my business plan and goals for the shop. I’ve gotten serious and invested in branded packaging as well as rethinking things like sales and ongoing promotions (Look for a brand new sale section in the shop coming soon!) Also, I bought a new tool– a Xuron needle nose pliers to replace my little pliers I’ve had for the last quarter of a century. My old pliers were giving out, giving me blisters and the spring was totally gone. But they had sentimental value. I bought them at the Laguna Beach Bead shop, back in high school. The shop owner (I believe her name is Peggy) was the first person to teach me how to make jewelry. She did it for free, and always took an interest in what I was making. My teen years were difficult– I don’t know if she knew how much she helped me by giving me these skills and being present in my life in that way. This is another reason why local businesses are worth supporting over mega stores! Would I have known someone like her if the only shops left where Michaels and HobbyCraft? I like to think I’m keeping the cycle going on Etsy, building the micro economy and making beautiful things. Thanks to everyone who has supported me thus far– here’s to the next leg of the adventure! The morbid sentimentality of Victorian mourning jewelry has long been an obsession of mine, though most of these objects are highly collectible and one can only dream of owning them. Though, sometimes by accident you happen across something that is really old, and really special– that is how I found the rosary featured. It was in a lot of the unloved and broken, the fragments I used to make many of my necklaces. My Vulcanite Mourning Rosary, available in my Etsy shop. I believe these beads to be vulcanite (often called gutta percha), which is a very early form of plastic that was widely used in Victorian times as it simulated jet. It was used until the early 20th century when bakelite was introduced. The crucifix features detailed ivy leaves and is marked France. The center medal is a Miraculous medal, and at Mary’s feet there is a date reading “1830”– this is not the date of the rosary but instead the date of the miraculous appearance of Mary commemorated on the medal, which is also marked France. These miraculous medals were used in the late 19th century. This rosary is quite beautiful, delicate and in wonderful condition.